What do you remember from Greenwich Village and Fire Island in the 70s and 80s? A generation of gay men came of age in the years after Stonewall, exhilarating in the boundless freedoms and temptations of that decade. And then came the 80s. Author Jeffrey Sharlach paints a brilliant picture of life in New York for a gay man at that moment in history. Running in Bed encapsulates the highs and lows of being true to oneself at a time when homosexuality was often considered a disease from which one could be cured. From the New York club scene to summers on Fire Island to the dawn of AIDS, Sharlach writes with humor, poignancy, and charm, presenting characters who are universal in their appeal. 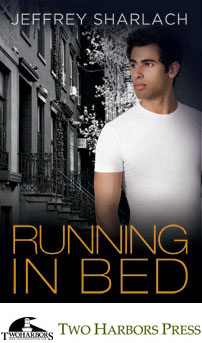 Running in Bed's incomparable, evocative images will resonate with readers, regardless of their personal persuasion.